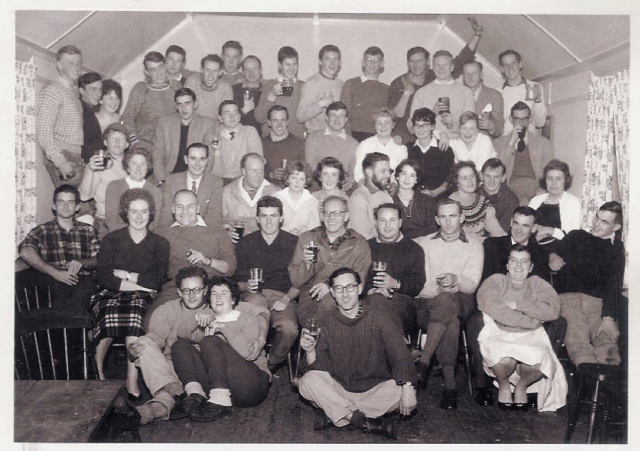 With a history dating back to the 1950s, North London Mountaineering Club has a rich heritage and a depth of experience among its members. The club started in Glendale Grammar School, Southgate, where some pupils went on trekking holidays to the Lakes and Wales with the teachers. The main influence was PE teacher Trevor Panther, a keen climber. One boy, Tony Killingback, was already into climbing with his father, Harry, and they had already made a number of first ascents. The students decided to form a club to continue climbing and mountaineering after they left school. The inaugural General Meeting was held at Southgate County School on 4th July 1956. Meetings quickly moved to the Fishmonger’s Arms, Wood Green. Some outdoor trips were organised, and it was decided to hold meets at New Year and Easter, via the club’s largest vehicle, a six-seater plus two in the boot, wooden Studebaker shooting brake. The October publicity meet brought in 10 new members including three young ladies. The club soon started looking for a property in North Wales. After a considerable search, in April 1962, the club found a property to rent just outside Capel Curig, comprising a cottage called ‘Bryn Brythenau’ and a barn. The cottage dated back to the 16th century, and had electricity and piped water. The barn was in a good structural condition but lacked doors and windows, and had no water or electricity – it was also knee deep in animal dung. Considerable work has gone into the cottage and barn over the years, and they are both now extremely welcoming buildings. The club subsequently purchased the freehold for both buildings. The cottage is now reserved for the use of club members, whilst the barn is rented out to groups. The cottage had a previous climbing connection – during the 19th century, the famous climbers Owen Glynn Jones and Ashley and George Abraham stayed there on climbing trips to Wales. Throughout the club’s history, many members have been involved in pioneering new climbs at home and abroad. Club members have established new rock and ice climbs across the UK, including such esoterica as routes on southern chalk (climbed with ice axes and crampons) and first ascents of many sea stacks. Many club members are still active in mounting expeditions. An entertaining account of a trip by club members to undertake the first ascent of the Golden Pillar of Spantik can be found here.